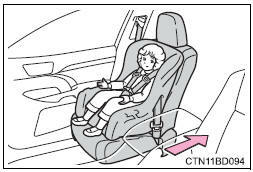 Raise the head restraint so that the top tether strap can easily be passed between the head restraint and seatback. Secure the child restraint system using the seat belt or latch anchors. Run the top tether strap under the head restraint. To prevent the belt from going into alr lock mode, do not fully extend the shoulder belt. Alr mode causes the belt to tighten only. This could cause injury or discomfort to the child. If the child restraint system is not correctly fixed in place, the child or other passengers may be seriously injured or even killed in the event of a sudden braking, sudden swerving or an accident. If the driver"�s seat interferes with the child restraint system and prevents it from being attached correctly, attach the child restraint system to the right-hand second seat. 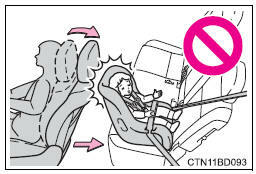 Adjust the front passenger seat so that it does not interfere with the child restraint system. Only put a forward-facing child restraint system on the front seat when unavoidable. When installing a forward-facing child restraint system on the front passenger seat, move the seat as far back as possible even if the �air bag off� indicator light is illuminated. Failure to do so may result in death or serious injury if the airbags deploy (inflate). when installing a child restraint system on the center second and third seat, adjust both seat cushions to the same position (second seat only) and align both seatbacks at the same angle. The seatbacks must be adjusted to the same angle. Otherwise, the child restraint system cannot be securely restrained and this may cause death or serious injury in the event of sudden braking, sudden swerving or an accident. 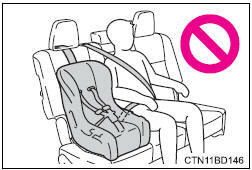 When using the latch anchors for a child restraint system, move the seat as far back as possible (second seat only), with the seatback close to the child restraint system. 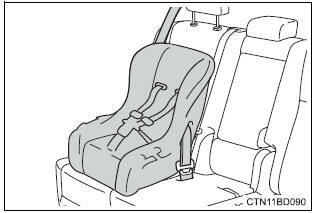 When a booster seat is installed, always ensure that the shoulder belt is positioned across the center of the child's shoulder. The belt should be kept away from the child's neck, but not so that it could fall off the child's shoulder. Failing to do so may result in death or serious injury in the event of sudden braking, sudden swerving or an accident. Ensure that the belt and plate are securely locked and the seat belt is not twisted. Shake the child restraint system left and right, and forward and backward to ensure that it has been securely installed. After securing a child restraint system, never adjust the seat. Follow all installation instructions provided by the child restraint system manufacturer. When using the right-hand second and third seat for the child restraint system, do not sit in the center second and third seat. Seat belt function may be impaired, such as being positioned overly high or loose-fitting, which may result in death or serious injury in the event of sudden braking, sudden swerving or an accident. If a seat belt extender is used when installing a child restraint system, the seat belt will not securely hold the child restraint system, which could cause death or serious injury to the child or other passengers in the event of a sudden braking, sudden swerving or an accident. 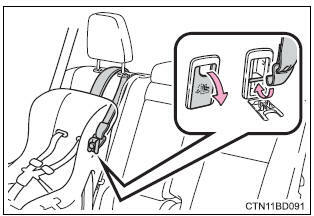 When using the latch anchors, be sure that there are no foreign objects around the anchors and that the seat belt is not caught behind the child restraint system. Make sure the child restraint system is securely attached, or it may cause death or serious injury to the child or other passengers in the event of sudden braking, sudden swerving or an accident.